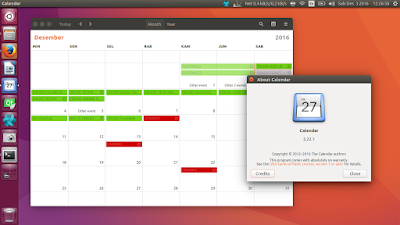 This article is about upgrading GNOME Calendar, if you want to import iCalendar .ics file to it, then read here. This article explains step by step how to upgrade GNOME Calendar to 3.22.1 in Ubuntu 16.10, 16.04, and 14.04 using GNOME3 Staging PPA. For your information, even in the latest stable Ubuntu 16.10 we have only the version 3.20 for GNOME Calendar. We can get the latest version by external repository, and that is what the PPA for. This article is written at 3 December 2016 with 3.22.1 version, so next time you may encounter this PPA version changed up to its maintainer. You can read GNOME Calendar Development Roadmap to find out new features added in 3.22. For your information, one of them is drag and drop support for task items. The output should be like this. This output says that my Ubuntu sees two different versions of GNOME Calendar, one version is 3.20.4 (installed, from official repo) and another version 3.22.1 (not installed, from PPA). What you want to install is this another version from PPA.